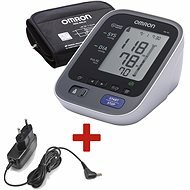 The OMRON M400 is a highly-reliable, practical and modern blood pressure monitor that will support your healthy lifestyle journey. It has a memory capacity of 2 people, obtaining and retaining up to 60 measurement records per person. The three-line display is large in size and easy to read. All measurements taken include a time and date stamp, meaning that you can easily keep track of your records and provide yourself with a comprehensive overview. Values are obtained by using the extended cuff on the arm—its generous circumference means that it is suitable for individuals varying in shape and size. 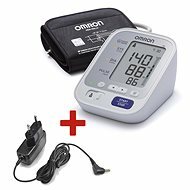 If the cuff is inappropriately fastened, the OMRON M400 will alert you so as not to threaten the accuracy of the measurement. Accuracy- Intellisense performs two blood pressure measurements during one measuring cycle. Initially, the cuff is inflated before an air valve is opened to slowly release the air pressure. By using this method, the dual measurement results are always accurate and reliable. Quick and Pleasant- During the initial stage of inflation, Intellisense is able to obtain a measurement by knowing exactly how much pressure is required. This results in a significantly shorter measurement time. Smart Detection - Intellisense is suitable for individuals suffering from certain types of heart arrhythmias. Additionally, heart rhythm disorders can be detected and displayed. 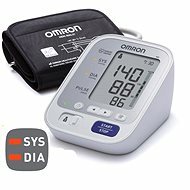 The OMRON M400 calculates the average systolic and diastolic blood pressure based on the last 3 measurements. This provides you with objective results and is particularly helpful if you’re prone to fluctuating blood pressure and hypertension. You no longer have to compare your results with the recommended \u200b values—simply refer to everything shown on the display. The OMRON M400 operates using batteries but is equipped to facilitate an AC adapter (not included in the package). The 3-year warranty is a great added bonus! For shipping to other EU countries visit this page OMRON M400. Für Versand nach Deutschland, besuchen Sie bitte OMRON M400. Chcete doručit zboží do Česka? Prohlédněte si OMRON M400. Chcete doručiť tovar na Slovensko? Prezrite si OMRON M400. Für Versand nach Österreich, besuchen Sie bitte OMRON M400. Magyarországra történő kiszállításért tekintse meg ezt a termékoldalt: OMRON M400.